We've all experienced it. Our vitual classroom participants often seem to have gotten together and planned to drive us crazy! Three people are logged on independently, another five are sitting in a room together watching your session projected onto a big screen, and two people are sitting in the same room as you because they wanted a face-to-face experience. What's a virtual trainer to do? Troy Perry has some advice. In his recent InSync Byte session, MULTI-METHOD DELIVERY: MANAGING VARIOUS AUDIENCES AT THE SAME TIME, Troy provides some advice about how to not just manage these audiences, but to make your programs great. As he says, "Multi-method delivery seeks to combine the best of the traditional, instructor-led classroom with the virtual classroom into a highly interactive and engaging experience for both groups of participants. In this session we will explore the benefits, challenges and best practices of implementing a multi-method delivery program." Want to learn more? Watch the recording of his session here. Interested in learning more about teaching in a multi-cultural environment? 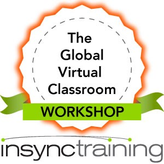 Check out our course, The Global Virtual Classroom Workshop, by clicking on the icon below.